Anthuan Maybank was one of two Hawkeyes to win a gold medal at the 1996 Atlanta Olympics. The other…well, if you know anything about Hawkeye wrestling, you’ve probably heard of him. Tom Brands was born in 1968 and grew up in the town of Sheldon in northwest Iowa. He first gained attention as a wrestler in high school by compiling a prep record of 109-12. Brands’ best season in high school came in 1986; that year he compiled 477 points, 158 takedowns, a 34-0 record, and a state championship. Brands chose to wrestle for Iowa coach Dan Gable, and he went on to become one of the most dominant wrestlers in Hawkeye history. He placed fourth in the NCAA tournament as a freshman in 1989 before ripping off three straight NCAA titles from 1990-1992. He put together a 158-7-2 record at Iowa that included 46 pins. His 158 wins rank second in school history. He was also a three-time team captain under Gable. In his final meet in 1992, Tom Brands blew away the field and was named the Outstanding Wrestler of the 1992 NCAA Championships. Brands wasn’t finished with competitive wrestling after college, either. He won a gold medal at the 1993 World Freestyle Championships in Toronto just after leaving Iowa. 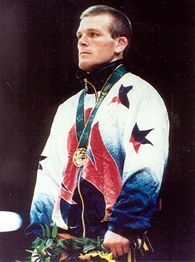 Brands followed that up with two World Cup gold medals in 1994 and 1995, and he was a champion at the 1995 Pan American Games. So by the time the 1996 Olympics in Atlanta rolled around, you knew Brands would be chasing his ultimate goal: an Olympic medal. In the 136.5 pound weight class, Brands blew through the field. He throttled his first two opponents by a combined score of 8-0 to reach the semifinals against Russia’s Magomed Azizov. He seized a 4-0 lead against Azizov before surrendering a takedown (and a point) with 53 seconds left. Brands “settled” for a 4-1 victory and a berth in the gold medal match against Jang Jae-Seong of South Korea. You can watch the gold medal match here, but I’ll spare you the suspense: Tom Brands dominates Jang, 7-0, to strike Olympic gold. The single point he yielded to Azizov in the semifinals was the only thing that kept him from matching Gable’s unscored upon dominance in the 1972 Olympics. And I’m sure you know the rest of the story. Brands served as an assistant coach at Iowa under Gable and later his successor, Jim Zalesky, for 12 seasons from 1993-2004. Brands finally left Iowa to take over the head coaching position at Virginia Tech, where he coached for two seasons. Zalesky was fired after the 2006 season, and Iowa hired Brands as their new head coach to restore Hawkeye wrestling to its former glory. Tom Brands has done just that, leading Iowa to an NCAA championship in his second season in 2008 and following it up with NCAA titles in 2009 and 2010. Tom Brands was one of the greatest athletes in Hawkeye history and the classic example of Gable’s wrestling style in action. He now continues Gable’s legacy as Iowa’s head coach. But he’s also remembered as the last Hawkeye wrestler to deliver a gold medal at the 1996 Olympics. I’m sure Brands is hoping that his coaching will help mentor another Hawkeye to Olympic gold soon enough.